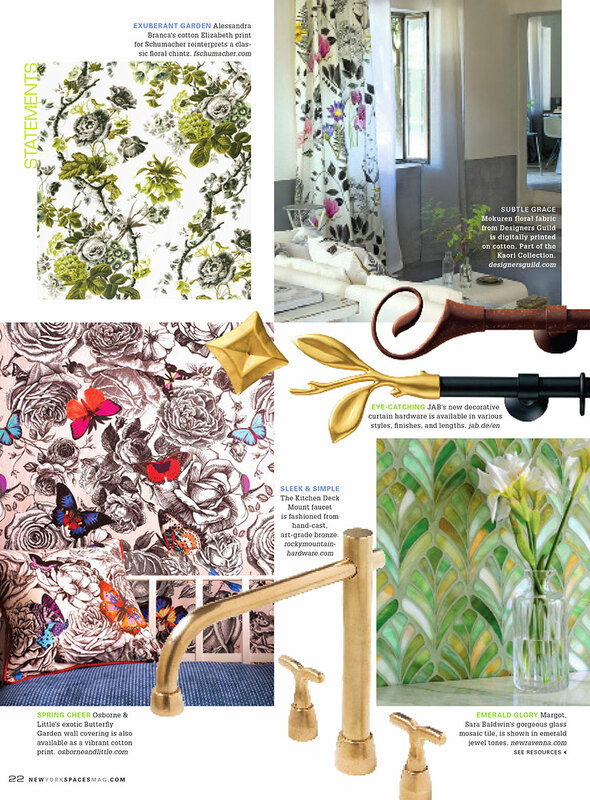 New Ravenna is featured in New York Spaces magazine’s March-April Issue. Dubbed “Emerald Glory” the Margot tile, one of Sara Baldwin’s gorgeous glass mosaic tiles, is shown in emerald jewel tones. The Margot pattern is included in the Aurora Collection, designed by Sara Baldwin. The collection consists of 24 mosaic designs hand crafted in natural stone, 24k gold glass, jewel glass, and shell. Each mosaic consists of hundreds of small individual pieces that have been hand cut and assembled by artisans on the Eastern Shore of Virginia. Aurora was inspired by Sara Baldwin’s travels to cities steeped in gilded history where architecture is punctuated by flashes of brilliant gold. “My travels to Paris, Istanbul and St. Petersburg became the origins of my thoughts about material cultures that celebrate luxury with texture and contrasting surfaces” says Baldwin. ” I dreamt about these historic patinas that grew only more beautiful with the passage of time.” Every mosaic in the Aurora Collection is a custom creation, sized to fit each installation. The remarkable pattern changes its personality drastically with its colorway, proof is how markedly different it looks in a combination of Tiger’s Eye Jewel Glass and 24K Gold Glass. The mosaics can be installed on both vertical and horizontal surfaces. The Aurora Collection, which is available at all New Ravenna showrooms throughout the United States, Canada, Europe, Russia, and Dubai, garnered a tremendous amount of attention by the media when it was released, placements by Bella Figura Publications on par with this placement in New York Spaces magazine.